Natural tropical peat swamp forests are important for their rich biodiversity and serve as a huge carbon pool. However, peat swamp forests are decreasing due to deforestation, conversion into farm land, excessive draining, the use of shifting cultivation on a large scale, illegal logging, forest fire and palm oil plantation. Airborne laser scanning (ALS) also termed airborne Light Detection and Ranging (LiDAR) data is nowadays a good single sensor to investigate bio-geophysical parameters in remote tropical rain forest areas (e.g. tree canopy height which is strongly correlated with above ground biomass). 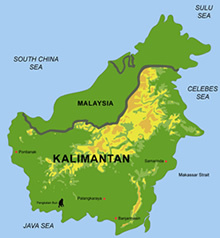 Bi-temporal airborne LiDAR data acquired in August 2007 and August 2011 were used to characterize peat swamp forest changes located in Central Kalimantan, Indonesia. We measured the tree height and Canopy Height Model (CHM) with LiDAR, segmented the canopies and then compared the tree height with the field measurements. Additionally, we collected ground field measurements at Sabangau forest transect in order to characterize some biophysical properties of different peat swamp forest physiognomies such as diameter at breast height (DBH), tree-height, leaf area index (LAI), crown coverage and above ground biomass (AGB). From the bi-temporal LiDAR Data we analyzed the forest regrowth and the peat subsidence. This work can be promising in the REDD+ (Reducing Emissions from Deforestation and forest Degradation) framework of knowledge of tropical PSF. The LiDAR technology supports the MRV (Monitoring, Reporting, and Verification) aspect of REDD+. Index Terms—Above-ground biomass, carbon, Central Kalimantan, forest regrowth, LiDAR technology, ombrogenous peat swamp forest, peat subsidence, REDD, tropical peat. TROPICAL lowland ombrogenous peat lands in Southeast Asia are known for their rich biodiversity and huge amounts of stored carbon . In recent years, large natural areas of this endangered ecosystem has been converted into oil palm and acacia plantations. Hence, forest remnants are currently threatened by extensive drainage, logging, hunting and fire. Undisturbed peat swamp forest display specific surface patterns linked to hydrology which reflects on biodiversity, vegetation structure and carbon dynamics. The key importance of peat swamp domes to ecological processes, their fragility and impact to global climate and carbon budgets highlights the need for a comprehensive forest inventory of peat swamp resources across Indonesia. Remote sensing data can provide useful information in such environments for hydrological and wil fire modeling, retrieval of biophysical parameters and the management of natural resources –. Bi-temporal airborne Light Detection and Ranging (LiDAR) data acquired in August 2007 and August 2011 were used to characterize the peat swamp forest and dome located in Central Kalimantan, Indonesia. In this study our main objectives were: a) to characterizeground-measured and LiDAR-derived biophysical properties with both forest physiognomy and peat dome slope variations; and b) to present an approach to carbon change assessmentbased on multi-temporal LiDAR acquisition as the experimental data covers forest regrowth and peat subsidence. 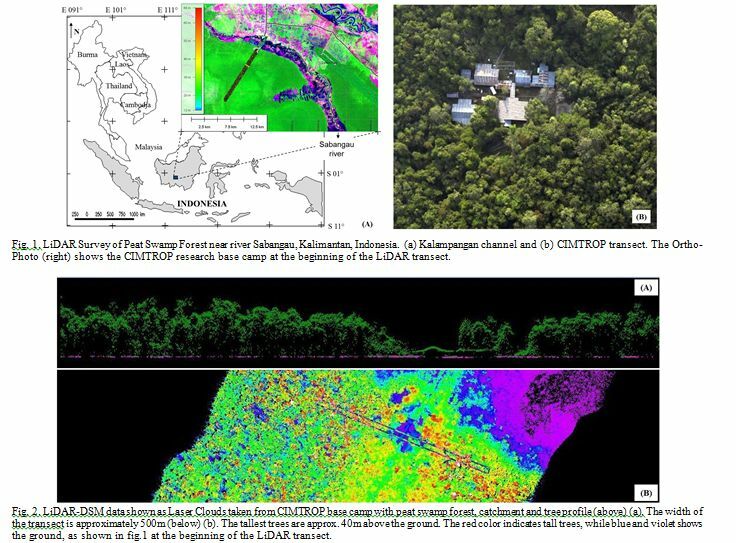 The study area encompasses two LiDAR transects in one test site located in Central Kalimantan, Indonesia (Fig. 1). The Sabangau test site is located inside theNatural Peat Swamp Forest Laboratory (NPSFL) and managed by the Centre for International Co-operation in Sustainable Management of TROpical Peatland (CIMTROP). It is also located inside the Sabangau National Park (SNP).The base camp has been the site ofmuch PSF research in the past 20 years. Fig. 2 shows the LiDAR point clouds taken from the CIMTROP transect with a profile of the base camp. The red and blue colors represent high trees and the peat ground respectively and violet represents the ground of the Sabangau catchment. The ground field measurements were also acquired in the CIMTROP transect with 52 sample areas. The test site is relatively flat, ranging between the 15 m height of the Sabangau river respectively 18 m from the research base camp to a maximum of 31m towards the peat dome plateau, as shown in Fig. 3. According to ,  the peat thickness of the Sabangau test site varies from 0 to 12 m. The peat surface has a maximum slope of 1.7 m/km . The forest was selective logged until 1997. Therefore trees with DBH 60 cm are missing.